Wakayama Prefecture (和歌山県, Wakayama-ken) is a prefecture in the Kansai region of Japan on the island of Honshū. The capital is the city of Wakayama. Wakayama Prefecture is surrounded by Osaka Prefecture, Nara Prefecture, Mie Prefecture, Hyogo Prefecture and Tokushima Prefecture. In the Meiji period, Wakayama Prefecture was created from the western part of Kii Province. Wakayama's southwestern coastline faces the Seto Inland Sea and its southeastern coastline is on the Pacific Ocean. 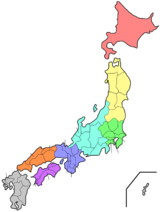 The northern borders of the prefecture meet Osaka Prefecture, Nara Prefecture, and Mie Prefecture. National Parks are established in about 9% of the total land area of the prefecture. Hinokuma-kunikakasu jinjū is the chief Shinto shrine (ichinomiya) in the prefecture. ↑ Nussbaum, Louis-Frédéric. (2005). "Wakayama prefecture" in Japan Encyclopedia, p. 1026; "Kansai" at p. 477. ↑ Nussbaum, "Wakayama" at p. 1025. ↑ "Nationwide List of Ichinomiya," p. 3; retrieved 2012-3-13. This page was last changed on 31 August 2017, at 14:41.